NotDeft is an Emacs-based manager and local search engine for directories of plain text notes. NotDeft features a Xapian backend for efficient free-text search over potentially very large numbers of note files; in that respect it is like the Notmuch Emacs mode for managing email. NotDeft is a spin-off of the Deft note manager, and retains similar functionality for browsing, filtering, and managing note collections. While NotDeft inherits its user interface from Deft, that interface is used for managing search result sets of notes, rather than directory contents. When used together with Org mode and its support for document linking, NotDeft can also function as a “desktop wiki,” such that documents can also be found by following links, and not just by searching and filtering. For the impatient, this section outlines one way of downloading, installing and setting up NotDeft. where make is assumed to invoke GNU Make. If the make command fails, then you will need to ensure that you have the required libraries installed, and find the right C++ compiler incantation for building the notdeft-xapian program on your system. A notable library requirement for compiling the program is TCLAP. The “notdeft-example.el” file is a sample configuration for NotDeft, which sets up NotDeft for use with Org mode based note files, also enabling some optional components of NotDeft, and setting up some keybindings. It may be a useful starting point for a personal configuration. Create a “~/.deft” directory, and copy some “.org” files there. Press TAB to enter a search query, and type characters to do further filtering of the results. Press RET to select a file to open. Use C-c f1 to see other available commands. To configure notdeft-note-mode minor mode for use automatically in note buffers, add the required directory local variable to “~/.deft” by entering the command f6 a d l v, and by saving the resulting file. For other ways to install, configure, and use NotDeft, see the rest of this page. Rather than supporting a single, customizable deft-directory (tree) of note files, NotDeft supports a customizable notdeft-directories search path of directory trees. If the search path includes multiple directories, then many file creation and management operations involve choosing a directory, making NotDeft not so deft. NotDeft supports (optional) invocation of a notdeft-xapian-program, which uses the Xapian library to implement free-text search across note files, with convenient query syntax. The search is performed across all notdeft-directories, and further narrowing down of the result set can then be done incrementally by typing in a search string for purposes of filtering (as in Deft). That is, when notdeft-xapian-program is set, the file browser of NotDeft lists Xapian search results instead of listing directory contents. NotDeft includes multiple functions and commands intended to be usable from outside notdeft-mode, leading to more complex modalities of use than with Deft's list view centric operation. NotDeft supports the existence of multiple notdeft-mode buffers within a single Emacs instance, so that one can view and operate on multiple search result sets of notes simultaneously. NotDeft is not Deft—it aims for wide utility rather than the user experience of a Notational Velocity type application. The added complication of having two stages (query, then filter) to the process of looking for interesting files makes NotDeft less simple and intuitive than Deft, as does having multiple directories, modalities, and buffers. NotDeft can be installed either manually, or as a package. While the above commands acquire, build, and set up NotDeft's Emacs Lisp code, they do not yet build or configure the C++-based Xapian backend; see Building the Xapian Backend and Configuring the Xapian Backend. Installing from Git is recommended where you wish to be sure that you are installing the most recent available version. Still, installation from a downloadable package file is also an option. No documentation is shown by that command, but it does show the location of the package's files, allowing navigation to the documentation. While installing the package does unpack the Xapian backend source code, it does not build it or configure it; see Building the Xapian Backend and Configuring the Xapian Backend. should do the trick, provided that the required libraries have been installed. On other systems you will need to find the right C++ compiler incantation for building the program. You can have multiple directories, which makes NotDeft use a bit harder, as you may at times get asked for a target directory for some file operations. If you wish to include some additional text files into your searches, you may also explicitly specify files that reside outside any of the notdeft-directories. You must still specify a directory for a search index covering those files. In effect, you specify a sparse directory, since it is not scanned, but rather only explicitly specified files are considered to be NotDeft notes, if they exist. where all note file paths are specified relative to the search index containing directory, which should be a parent directory of all the specified notes. When creating a note file with the notdeft-new-file-named command, NotDeft automatically derives a name for the file based on the title that is provided for the note. The configuration option notdeft-notename-function determines how the name is derived. The default implementation is suitable for titles with ASCII letters, and you probably want to pick a different implementation if your titles do not tend to use the English alphabet. The configuration variable notdeft-xapian-max-results controls the maximum number of files to list in a notdeft-mode buffer. You may set it to 0 to always have all results displayed. The default is to order the results so that most recently edited files are listed first, but you may change this behavior by setting notdeft-xapian-order-by-time to nil, in which case Xapian's ranking mechanism is used instead. Running the notdeft command switches to a *NotDeft* buffer, creating one as necessary. Such a buffer's major mode is notdeft-mode. Buffers with that mode are read only, and cannot be edited directly, although most keys without modifiers do cause editing of the filter string. That is, finding an interesting set of notes is a two-step process: (1) enter a query to define a “topic area” of interest, using the Xapian query syntax; and then (2) narrow down that set interactively by typing in a list of substrings (in any order) that should match. It is possible to edit the query without modifying the filter string, and vice versa. Figure 1: Querying and filtering in a *NotDeft* buffer. The NotDeft Mode interface is optimized for editing the filter string. You can append characters to the filter by pressing regular symbol keys without modifiers. Other available commands include DEL, M-DEL, C-y, with familiar Emacs style behavior. To enter a query, press TAB (or C-c C-o) to open a prompt for typing in the query. The query is then executed when you press RET. C-u C-c C-c also works for clearing the query in addition to any filter string. To manage the notes that are listed in the NotDeft Mode buffer, you can use mode-specific command, which are bound to the mode's C-c keymap. There are commands for renaming, deleting, and moving notes, for example. Press C-c f1 to see a full list of the commands bound to C-c.
To open a *NotDeft* buffer directly with a particular search query, use the command notdeft-open-query from any buffer. The filter string “emacs org mode” narrows a *NotDeft* buffer file list down only to the files that contain all of the substrings “emacs”, “org”, and “mode”. To see each of the matching positions within those files, consider entering the command C-c g (or M-x notdeft-grep-for-filter) to display the matching strings with highlighting. That command invokes the shell command grep (through the Emacs command grep), and displays the results in a separate buffer. This may fail to work if you system does not have a compatible grep executable on the search path. NotDeft allows multiple notdeft-mode buffers to exist at once, which may be useful if one wants to explore multiple sets of search results at once. Each NotDeft buffer has its own state, including a search query, filter string, default directory for creating new notes, etc. Normally, executing the notdeft command only creates a new *NotDeft* buffer if one does not already exist—otherwise the command merely switches to an existing *NotDeft* buffer. It is possible to have the command always create a new notdeft-mode buffer by invoking it with a prefix argument, i.e., C-u M-x notdeft. The notdeft-open-query command also accepts a prefix argument, to arrange for the search results to be listed in a new buffer. This behavior can also be made the default for that command by setting the configuration parameter notdeft-open-query-in-new-buffer to t. With that parameter set, the prefix argument's meaning is inverted, so that C-u M-x notdeft-open-query does not create an additional buffer. The question of whether to create a new buffer does not apply to other search commands. Within a NotDeft buffer, the commands notdeft-query-edit and notdeft-query-clear merely replace the buffer's search result set, whereas the commands notdeft-lucky-find-file and notdeft-query-ido-find-file do not use a NotDeft buffer for displaying their results. For dealing with existing notdeft-mode buffers, there is a notdeft-switch-to-buffer command for interactively selecting a buffer and switching to it. It presents a choice list of buffer names in the minibuffer, and shows any query and filter strings associated with those buffers for better informed selection. Without a prefix argument, it buries the current buffer. With one prefix argument, it kills the current buffer. With two prefix arguments, it kills all notdeft-mode buffers. Figure 2: Four Emacs “windows” with different NotDeft buffers. By default, NotDeft does not show any note directory or file names in its list view, but this behavior can be controlled by specifying a notdeft-file-display-function. We refrain from displaying any directory information in cases where the Emacs window is very narrow (as indicated by the w argument), as otherwise there will be little space left for the note titles. Figure 3: NotDeft mode with directory indicators. Invoking the notdeft command opens an Emacs buffer whose major mode is notdeft-mode. That mode displays a list of notes, and if you want the list to be automatically updated when a note file gets saved, you may want to enable the notdeft-note-mode minor mode for those files' buffers. The sole purpose of notdeft-note-mode is to take care of keeping NotDeft's knowledge of the note collection up to date. Whenever a note file is saved, notdeft-note-mode sees to it that the search index is updated with the new file contents. NotDeft does not itself do anything to enable that mode, but rather the user should arrange for that to happen in some suitable way (see below for some suggestions). 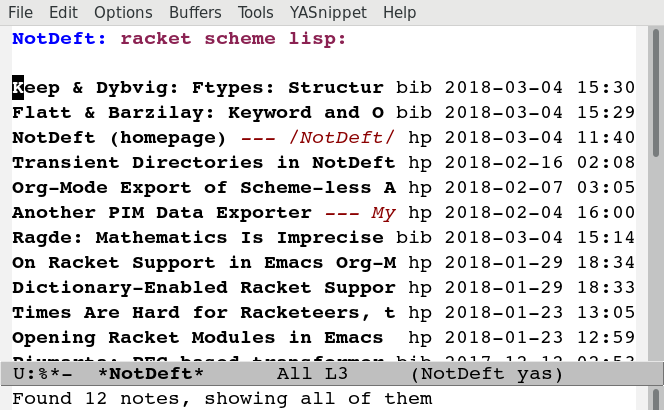 The benefit of this approach is that even if a note file then is open using a regular Emacs command (e.g., find-file), the editing buffer will notify NotDeft of any changes. This approach should be safe in that changes to files not residing in notdeft-directories get ignored by NotDeft. Still, the approach has the disadvantage that the minor mode indicator “¬D” does not tell you whether a note is actually a NotDeft note. This way of declaring both a major and minor mode appears to work at least in some versions of Emacs, although it may rely on undefined behavior. "Whether to enable NotDeft note mode for a buffer." We cannot just use org-mode-hook, as directory locals are not yet set at the time when the mode is enabled. What is needed is a later hook, which in the above is called org-mode-local-variables-hook. "Run hooks for `major-mode' with locals set. The above solution gives us a “proper” way to enable the NotDeft note minor mode, and to do it only within directories that have a persistent NotDeft “signature” (in a “.dir-locals.el” file), and only for our chosen note-editing major modes. which then interactively asks for a search query for opening up in a NotDeft buffer. That command can of course be bound to a key. which also asks for a search query, but then proceeds to open up the most highly ranked result file directly, without going via a *NotDeft* buffer. This command is similar to find-file in Emacs, but avoids having to specify the path of the file you're interested in; instead, this approach to “file finding” relies on sufficiently unique titling or tagging of the notes involved. after which the command [f6] o should invoke the notdeft-open-query command in any mode that does not override the binding for F6 with something else. which is intended for tagging notes with keywords, in a way that does not set any tags for Org. As for Org, the keyword names are case insensitive, so that one can write #+title instead of #+TITLE. You can have in-buffer settings even if you do not use Org for your notes—the syntax for in-buffer settings is the same regardless of the markup language used in notes. Even in a plain “.txt” file, you can still specify #+KEYWORDS, for example. Stemming is used also on tags, and so the query “tag:tag” will find these two notes (assuming English stemming—see notdeft-xapian-language). The usual Xapian search query syntax is available for NotDeft queries, with some additional query modifiers (see below). Operators such as AND, OR, and XOR are available, and they may also be written in lowercase (or mixed case) if notdeft-xapian-boolean-any-case is set to t. The NOT operator is also available if notdeft-xapian-pure-not is t. It is possible to query for a phrase by quoting the phrase (e.g., "Deft for Emacs"). To look for a search term without stemming, give it capitalized (e.g., "Abstract" will not match “abstraction”). Wildcards in search terms are not supported (trailing wildcards are supported by Xapian, but not enabled in NotDeft). Indicates that the search term must appear in the (non-directory, non-extension) filename. Indicates the string that must be the filename extension of the file (without the "."). Indicates that the search term must appear in the title. Indicates that the search term must appear among the tags given to the document. The tags for a note are specified either with the standard Org file property #+FILETAGS, or the custom file property #+KEYWORDS. Prefix a query with !time to have the results sorted by decreasing file modification time, even if the notdeft-xapian-order-by-time configuration option is disabled. Prefix a query with !rank to have the results sorted by decreasing relevance, regardless of the notdeft-xapian-order-by-time setting. Prefix a query with !file to have results sorted by (non-directory) file name, alphabetically, in decreasing order. Overrides all of the other sorting settings and modifiers. Prefix a query with !all to show all matching results. Note that unless you specify this modifier, the contents of a query result list may differ depending on how the results are sorted, since less highly ranked notes may get excluded. A space character must be used to separate the above keywords from the rest of the query string. The !file modifier might be useful for instance when you have file names such as “2017-01-01-0001.txt” and “2017-09-19-0123.txt”, and you would like to see them in chronological order by “creation time”, even if some of the files have been edited, and consequently have had their modification times changed. which works if the notdeft-xapian-pure-not option is set. to list all documents mentioning Emacs. which will match both “Ayn Rand” and “Rand, Ayn” in a title. will not yield any results, regardless of the sets of tags in your notes, or the way they have been declared. 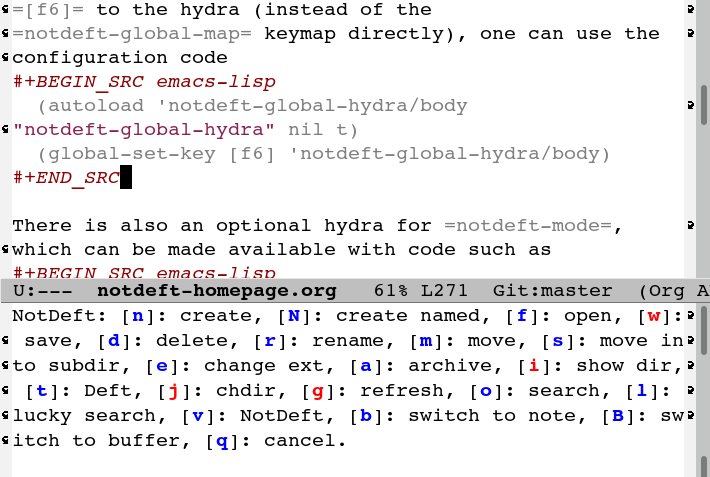 Figure 4: A NotDeft command “hydra” invoked from Org mode. in your Org startup code, to set up support for “deft:” and “notdeft:” links in org-mode. A “deft:” link names a note by its non-directory filename, whereas a “notdeft:” link contains a NotDeft Xapian search expression. Org mode's org-store-link command may be used to capture any Xapian search in a NotDeft buffer, to be later inserted with org-insert-link. The notdeft-org feature also defines NotDeft-specific notdeft-kill-ring-save-org-link and notdeft-insert-org-link commands for capturing and inserting “deft:” links. It is “deft:” links in particular that allow NotDeft to be used as a desktop wiki, linking documents by topic, where a topic is named by the non-directory name of a note file. For “deft:” links to consistently resolve to the same note, you should name your note files uniquely. NotDeft will look for a “notdeft.org” file anywhere in the note collection, and open the first match. to move a note file into a different directory does not cause any “deft:” link to break, whereas regular “file:” links may break. That command is also bound to C-n in notdeft-global-map, and if that keymap is bound to the prefix [f6], for example, then you can create a new note with the key combination [f6] C-n. The capture facility supports the definition and use of org-capture-templates for different purposes. A caveat with Org capturing is that unless you have already opened the capture file under NotDeft, any newly captured items may not immediately get noticed by NotDeft. To ensure that NotDeft is aware of any changes, one might arrange for the capture file to include file variables for enabling the notdeft-note-mode minor mode for any buffers opened for that file. Setting directory local variables are another option. Note that different org-capture-templates may define different capture locations. Consequently, it may be appropriate for the templates themselves to embed code for performing the registration (e.g., as shown in the capture from Firefox section). Now you can copy/move/link any attachments for the note into that subdirectory, and it is convenient to move the note together with its attachments using a regular file manager. To move a note from within *NotDeft*, the command C-u C-c m can be used to move it under another NotDeft root directory, where the prefix C-u assures NotDeft that the file really is to be moved together with its subdirectory. and the command C-c C-x C-v can be used to toggle inline display of images. Org itself has its own attachment management mechanism, whose action menu is bound to C-c C-a. This mechanism allows an attachment directory to be associated with an Org heading (as identified by information stored within the heading's properties), and thus the NotDeft note file itself can reside directly within a NotDeft root directory. Org has no command for moving an Org file together with its attachments, however. This way it is still convenient to move a note together with its attachments, and Org commands such as C-c C-a o (for opening the attachments) can still be used. Any directories whose names begin with an underscore will be excluded from Xapian searches, and thus such an archived note will no longer clutter search results. which by default is not an extension recognized by NotDeft. The org-protocol feature of Org mode provides a way for external applications to interface with Emacs and Org, and that mechanism can also be adopted for capturing data into NotDeft. For example, data can be sent from Firefox to NotDeft using the predefined store-link and capture protocols. and open that file in Firefox, and click the link, after which a “Launch Application” dialog is presented. “Choose other Application”, tick the box “Remember my choice for org-protocol links”, and specify emacsclient as the executable. That application selection can later be modified from Firefox “Preferences” / “Applications”. If required, the “Content Type” should be removable at least by editing the “mimeTypes.rdf” file in the Firefox profile. which is bound to C-c C-l in Org. The capture protocol, in turn, allows for web page content and metadata to be captured from Firefox into Emacs. Configuring the capture protocol for use with NotDeft is slightly more involved than in the case of store-link, as we must choose what page data to store, and where in our NotDeft note collection to store it. Suppose we wish to store any currently selected text, along with the URL of the containing page, and a capture timestamp. Suppose also that we wish to store it into a file whose name is derived from the page title, so that if we capture multiple times from the same page, then all of the captured text snippets will end up in the same note file. where we have given the name “w” for the Org capture template. This definition assumes that the link :description is available from org-store-link-plist, and that it corresponds to the document.title; this may be undocumented functionality, but works in Org mode 9.1.1. The notdeft-switch-to-file-named derives a filename from the description, creates that file if it doesn't yet exist, and returns the complete file name. Press TAB (or M-x notdeft-query-edit) to be prompted for a Xapian query. If nothing happens when you press TAB, then you have probably not configured a value for notdeft-xapian-program. Assign a value to that variable. Having pressed TAB, enter a query string at the prompt, one that should match some notes, and press RET. If that reports "Found no notes", or an unexpected set of notes, then your search index may not be up-to-date, perhaps due to filesystem changes outside of NotDeft. Invoke the command M-x notdeft-refresh (i.e., C-c C-g) to refresh the search index. If you suspect that your search index may be corrupt or incompatible in some way, you may invoke the command M-x notdeft-reindex (i.e., C-c R) to fully rebuild the search index, instead of just refreshing it. 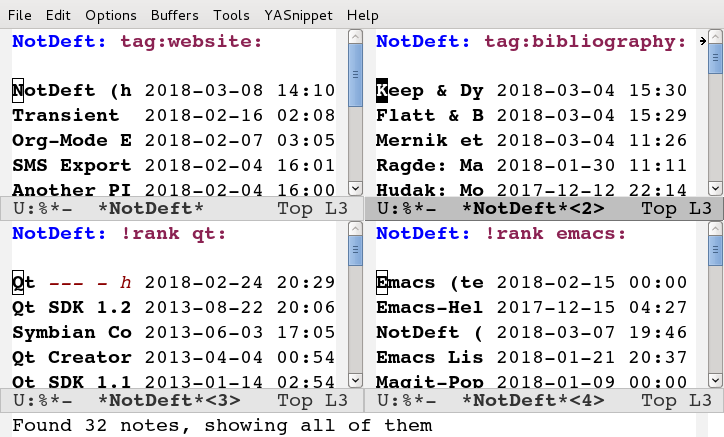 If your search query includes prefix terms such as “title:Emacs”, and you do not get all the expected matches, then make sure that any lines before any #+TITLE (or, #+KEYWORDS, etc.) are either whitespace only or begin with “#”. While the Org markup language allows in-buffer settings to appear anywhere in a file, NotDeft only scans the beginning of each file for such settings. If all else fails, a tool such as xapian-delve may be used to inspect the contents of the search index to see which terms it actually contains. Written on Tuesday, August 22, 2017 by Tero Hasu. Revised on Sunday, February 10, 2019 .